Dexilant | What Is Dexilant and What Is It Used For? What Is Dexilant Used to Treat? Dexilant, generic name dexlansoprazole, belongs to a class of powerful acid-suppressing medicines called proton pump inhibitors (PPIs). These drugs may cause rare, life-threatening side effects. 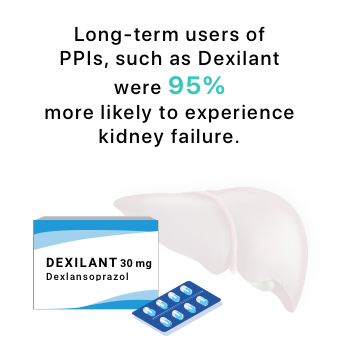 Dexilant is one of several PPIs named in lawsuits over serious kidney problems. Dexilant (dexlansoprazole), like other proton pump inhibitors (PPIs), suppresses the body’s ability to produce stomach acid. A modified version of lansoprazole (Prevacid), Dexilant delivers time-released doses in two waves. The first is released within an hour of taking the drug. The second release happens about four to five hours later. Dexilant is available by prescription only in 30- and 60-milligram doses. There is no generic version or over-the-counter version of the drug. People with liver disease should not exceed a daily 30-mg dosage of Dexilant. Takeda Pharmaceuticals manufactures Dexilant. The U.S. Food and Drug Administration approved Dexilant for use in adults in January 2009. In 2016, the FDA approved Dexilant to treat certain patients from 12 through 17 years old. Dexilant is a heartburn medication approved to treat certain conditions caused by excessive stomach acid. Other PPIs, including Prilosec, Nexium, Prevacid and Protonix, may be approved for more uses than Dexilant. Dexilant shares many of the same proton pump inhibitor side effects with other drugs in its class. The class of drugs has been on the market since the 1990s. In that time, countless studies have looked at the potential risks of taking PPIs long-term. In addition, PPI lawsuits blame the drugs for causing serious injuries to the people who took them. People should never stop taking Dexilant suddenly. Doing so can cause symptoms to return at a greater intensity than before. It can also create new health problems. People taking Dexilant or any other PPI should stop only after talking with their doctor and working out a plan to safely stop. In some cases, a doctor may be able to prescribe a proton pump inhibitor alternative. But in others, a doctor may determine that continuing Dexilant is a safer option than switching to another treatment. The Dexilant label carries several warnings and precautions about potentially serious side effects. But it does not list all potential Dexilant side effects. The FDA requires manufacturers add warnings to a drug label when there is increased scientific evidence of a possible risk. Dexilant does not have a black box warning, the most serious warning the FDA can require. People should talk with their doctor about other drugs they are taking before taking Dexilant. More than 1,800 drug products may cause proton pump inhibitor interactions if taken with Dexilant or other PPIs. Minor Dexilant side effects are more likely than serious side effects. Common Dexilant side effects for adults are slightly different from those adolescents may experience. Studies have associated long-term PPI use with serious kidney complications since the 1990s. A 2017 study in the journal Kidney International found that PPIs, such as Dexilant, were linked to gradual but silent kidney damage. The study said that doctors often rely on patients showing signs of kidney problems before stopping PPI use. But researchers found that more than half the patients who developed kidney damage showed no sign until the damage was done. Long-term use of Dexilant or other PPIs may increase the risk of a serious kidney injury called acute interstitial nephritis (AIN). AIN is defined by kidney inflammation. It can often be treated if caught early, but in rare cases it can cause permanent damage. Left untreated, AIN can lead to metabolic acidosis. That’s a condition in which the kidneys cannot remove acid from the blood. It can cause kidney failure and end-stage kidney disease. People who experience symptoms of AIN should contact their doctor immediately. Studies have found that people who take PPIs may have a higher risk of serious kidney disease. A 2016 study in JAMA Internal Medicine compared people who took heartburn drugs with those who didn’t. Researchers found that PPI users had a 20 to 50 percent higher risk of chronic kidney disease (CKD). But people who took H2 blockers, such as Pepcid or Zantac, had no similar risk. Another 2016 study in the Journal of the American Society of Nephrology also found an association between PPIs, such as Dexilant, and kidney disease. It found that long-term PPI users were 95 percent more likely than people who didn’t take the drugs to experience kidney failure. The study also found that PPI users were 28 percent more likely to develop CKD. Other studies have shown long-term PPI use may increase the risk of other serious conditions, including cancers and heart attacks. 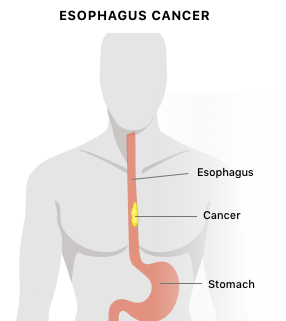 PPIs may be responsible for many esophageal cancer cases. A 2018 study published in Cancer Epidemiology found PPIs may be responsible for a surprising number of esophageal cancer cases. Researchers examined the medical records of 796,492 people in Sweden who took PPIs during a seven-year period. 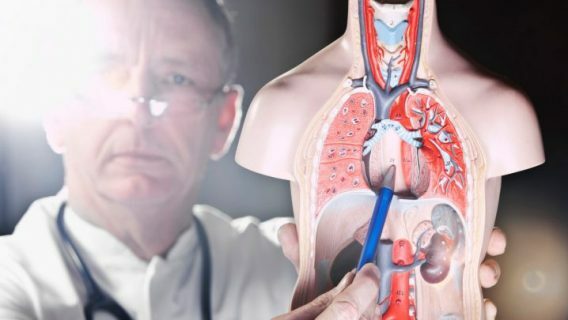 They concluded that long-term PPI use may have been responsible for one in every 20 esophageal cancer cases in the country. A 2017 study in the journal Gut found that taking PPIs could more than double the risk of stomach cancer. That same year, the FDA added a gastric-malignancy warning to the labels of Dexilant and other PPIs. The warning advises people to consider screening for gastric cancer if their response to drug is below standard. A 2015 study published in the journal PLOS One found that long-term PPI use was associated with an increased risk of heart attacks among the general population. Another study in PLOS One found an association between PPI use and fatal heart failure among people with coronary artery disease. The 2017 research found that the risk increased for people taking higher doses of PPIs. People who suffered serious kidney problems after taking Dexilant have filed lawsuits over their injuries. Dexilant lawsuits are among thousands filed against manufacturers of several different brands of PPIs. The lawsuits have been combined in a multidistrict litigation (MDL) in a New Jersey federal court. MDLs allow several similar lawsuits to move more quickly through the legal process. As of August 2018, there were 4,725 lawsuits pending in the proton pump inhibitor MDL. People who filed PPI lawsuits claim Dexilant or other PPIs caused kidney disease, injury or other serious conditions.